Another year, another chance for your club to ride ‘The Bobbo’. 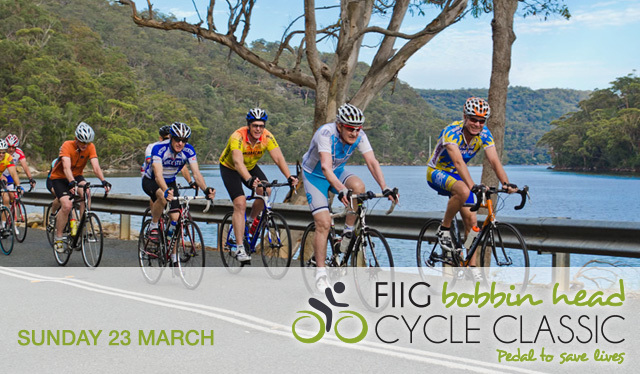 The 2014 FIIG Bobbin Head Cycle Classic is on Sunday 23 March and again has routes and distances to suit all rider capabilities. 104 km ride - for experienced riders seeking to ‘crack the tonne’ - from Turramurra to Mt Colah, through Bobbin Head, Terrey Hills and West Head. Return via Akuna Bay. 7:00am start ride fee $80. 80 km ride – for experienced riders not quite ready for ‘The Big One’ – the same as the 104 km without the 24 km West Head leg. 7.00am start, ride fee $80. 57 km ride - for regular riders wanting a less onerous challenge - the same route to Mt Colah and Bobbin Head to Terrey Hills then return. 7.45am start, ride fee $60. 12 km ride - for less experienced riders - through the quiet leafy streets of Turramurra and Wahroonga and return. 8.45am start, ride fee $15. Start & Finish: All rides start and finish at Karuah Oval, where there'll be food, drink, music and cycle exhibitions. Click here for full details, route maps and elevation graphs. King of the Mountain - who will win? Included this year is a 4.3 km 'King of the Mountain' time trial up the hill from Akuna Bay. Prizes for the best individual time and the best team (best 4 riders). Individual prize is a $1000 bicycle from Blackman Bicycles, team prize is a $1000 restaurant voucher. Half the funds raised goes to Lifeline to support their suicide prevention service. The rest goes to charities dedicated to the health and welfare of the young, KYDS, Eagles RAPS and BO Hospital. Please note the date in your club ride calendar.and ask your members to register now. How about entering a team? We would be delighted if your club entered a team to cycle this beautiful ride and support these very worthy causes. If you would like to promote your club to riders at the finish, please email info@bobbinheadcycleclassic.com.au and we will contact you to discuss.